There is hope at last that Irish people may be able to emigrate legally to the United States in the coming years. Tomorrow, Senator Charles Schumer of New York will introduce a bill which will allow up to 10,000 Irish a year to come and work legally in the United States, though not receive green cards. The visa plan is based on an Australian visa program that allows natives to come to America and indefinitely renew a work visa for them and their spouses. 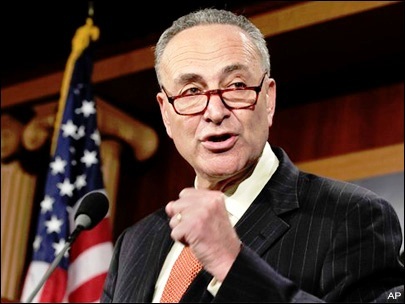 Schumer made the promise to introduce the E-3 program, as it is known, to a group of Irish American leaders who met with him on Friday. I was one of the people present, and we all realized that this bill would be a major step in the right direction. It came about because other countries – China, Mexico, India and the Philippines – have received special consideration for a new visa program, while the Irish were left off the list. That angered Irish community leaders, and Schumer has now stepped up to the plate to try and deliver. There is no guarantee, though, that the bill will be successful, but it is a very important first step, the first time since the Morrison and Donnelly visa programs that a bill to help the Irish legally live in America has been put forward. According to Bart Murphy, head of the Irish Lobby for Immigration Reform, the bill is a huge step in the right direction. “It finally brings a focus to all of our efforts, and I believe it may well prove successful, thanks to Senator Schumer,” Murphy said. If the bill for the other countries passes, Schumer is hoping that the Irish E-3 visas can be attached to it. If the bill does not pass, or if it is not possible to attach the E-3 visas, then he has promised early in 2012 to create another vehicle to help the Irish. On the face of it, the new visa, if passed, would not immediately help the Irish undocumented now resident in the U.S. But if a waiver rule can be applied as has happened in Mexico, where the local U.S. consulate allows those who have lived illegally in America to apply for visas, then it could make a huge difference. So the news on the immigration front is encouraging at last . . . but we have been here before on many other occasions. A few years back, it seemed certain that a bill sponsored by Senator Ted Kennedy and Senator John McCain would pass, but it fell apart at the last minute. There have been many other false dawns, but the Irish community has never given up on the idea of immigration reform, and they are not likely to now. Senator Schumer is one of the most powerful men in U.S. politics, with an Irish chief of staff, Martin Brennan, whose folks hail from Co. Mayo. Having him on the side of the Irish is a huge step forward in the right direction.